Bangalore: Software maker Microsoft Corp. on Thursday launched Windows 7 operating system in India, pricing it at least 20% cheaper than in the US to tackle piracy. Windows 7 can, however, hit stores only after the firm resolves a tax dispute with the customs department over the interpretation of tax rules introduced in July on imported packaged software. Microsoft is working with software lobby group National Association of Software and Services Companies to end the dispute, she said. Windows 7 is designed to be lighter and with more features than the Windows Vista operating system, the company said in a statement. Microsoft expects the new system, launched globally on Thursday, to revive sales after Vista flopped due to bugs and technical problems. A basic home version of Windows 7, available only in emerging countries such as India, is priced at Rs5,899, excluding taxes, while the high-end version, named Ultimate, will cost Rs11,799. In the US, the high-end version costs $320 (Rs15,000). “Some emerging countries have a differential price, basically to tackle piracy," Mehra said. Microsoft did not reveal the price of Windows 7 bundled with personal computer makers. India has alarming rates of software piracy pegged at 68%, Rakesh Bakshi, a counsel for Microsoft India, had said in an email interaction in July on intellectual property and piracy. Nearly 90% of Windows software is sold by bundling it with a laptop or a computer in India. The company said 16 computer makers such as Hewlett-Packard Co. and HCL Infosystems Ltd will introduce Windows 7 in about 100 laptop and personal computer models within a month. At least 1,500 Indian firms, including Infosys Technologies Ltd and Wipro Ltd, are changing over to Windows 7, according to Microsoft. The new software is being priced one-third lower than Vista in India, the company said in a statement. 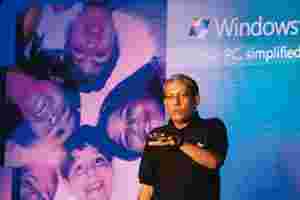 “We have launched Windows 7 in six editions, targeted at specific user groups," Microsoft India chairman Ravi Venkatesan told reporters in New Delhi.